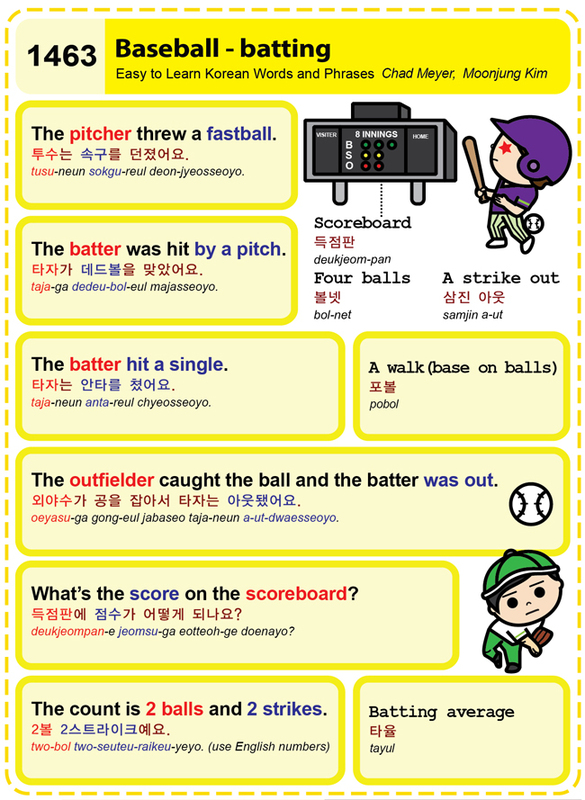 Easy to Learn Korean 1463 – Baseball batting. This entry was posted in Series and tagged 2볼 2스트라이크예요., A walk(base on balls), baseball, batting, batting average, four balls, scoreboard, strike out, The batter hit a single., The batter was hit by a pitch., The count is 2 balls and 2 strikes., The outfielder caught the ball and the batter was out., The pitcher threw a fastball., What’s the score on the scoreboard?, 득점판, 득점판에 점수가 어떻게 되나요?, 볼넷, 삼진 아웃, 외야수가 공을 잡아서 타자는 아웃됐어요., 타율, 타자가 데드볼을 맞았어요., 타자는 안타를 쳤어요., 투수는 속구를 던졌어요., 포볼 by easykorean. Bookmark the permalink.